After all, how can you expect your body to work and think at peak performance when you have not given it any fuel? How do you expect to avoid that mid-morning slump? If you don’t feed yourself a healthy breakfast what’s going to happen when those “hunger pangs” kick in long before lunch? Most likely you’ll be reaching for and snacking on foods that are high in calories, sugar and fats. Many people believe by skipping meals they can facilitate weight loss. However, eating a nutrient dense breakfast has actually been linked with weight loss and maintenance in adults. It provides a boost in energy and amplifies a positive mood while skipping breakfast sends the message to “conserve” energy which slows your metabolism down and decreases calories burn. Just eating breakfast is not going to get the job done. It’s what you build your breakfast around that’s important. Downing a cup of coffee and rushing out the door will never offer your body the same benefits that a bowl of hearty oatmeal can. To start your day off right, your focus should be on eating foods that offer fiber, protein, and micro-nutrients. Beginning your day the healthy breakfast way invigorates your body, gives your body nutrients and a boost of energy that powers you through your day. Breakfast not only gets our bodies going for the day but offers the first opportunity to improve nutritional intake. Oatmeal is the perfect way to start your day because it is high fiber, sugar-free and loaded with complex carbs. (Stay away from store-bought prepackaged varieties…they contain way too much sugar). Prepare oatmeal according to package directions. Meanwhile, while its cooking slice the apple and sprinkle with the cinnamon and half of the sugar. Place in the oven under broiler for 3-5 minutes or until slightly tender and then cut into very small pieces. From there, stir in the vanilla protein powder into the oatmeal until well mixed and then sprinkle on a little more cinnamon if desired. 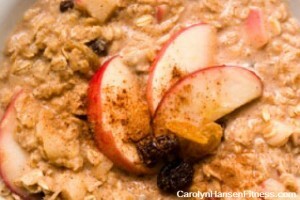 Stir in the remaining sugar, and top with the sliced apple and raisins. If desired, pour a little skim milk on top. Breakfast is truly the meal of “champions” raising the body’s energy level and after the long overnight “fast.” It is the most satiating meal of the day and impacts food consumption for the entire day as well as including how we perform mentally and physically.